Alittle intimidated to be making my first post on my first blog so, instead of jumping into talking about our preparations for our first homeschool year, I figured I’d take a step back into my comfort-zone and talk a bit about another one of our family firsts: our first sensory bin. 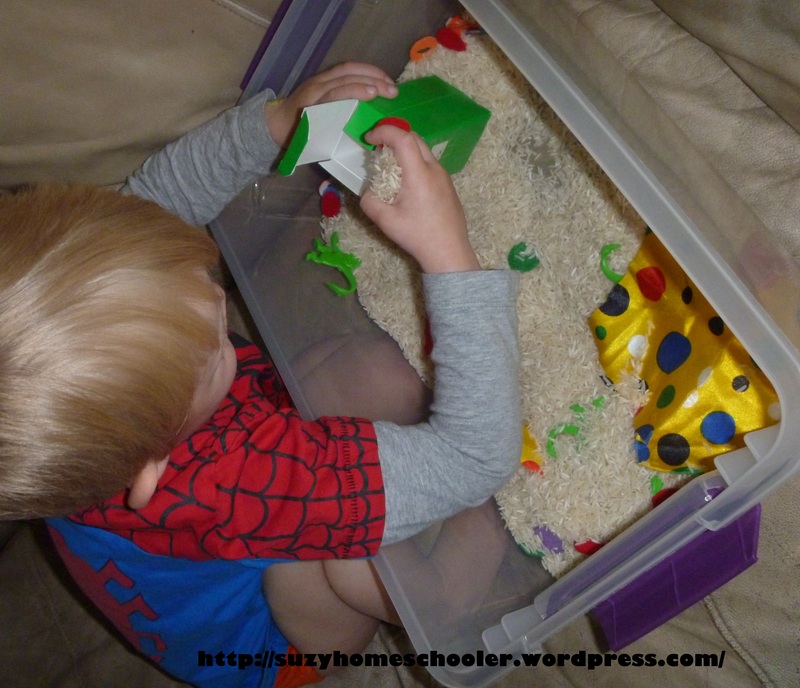 I fell in love with the idea of sensory exploration from the moment I first read about it and sensory bins seemed to be the least messy way of enjoying this type of play with my children. Of course it was only a matter of time before I let go of my fear of mess and started handing them bowls of shaving cream, but thats a post for another day. Our first bin was based off the book “Put Me in the Zoo ,” by Robert Lopshire. A personal favorite of my son’s. Inside the bin: plain white rice, a small “spot box,” plastic monkeys , foam letters spelling “zoo,” felt spots in varying colors, and squares of silky spotted fabric. LittleMan was fascinated and played with it for over an hour the first time we offered it to him, then asked to play with it again first thing in the morning the very next day. He filled the box with rice and poured it out. He filled the box with felt spots and poured them out. He poured the rice over his own hands. He rubbed the silk squares against his cheeks. Overall it was hit, and so our love of sensory bins was born. 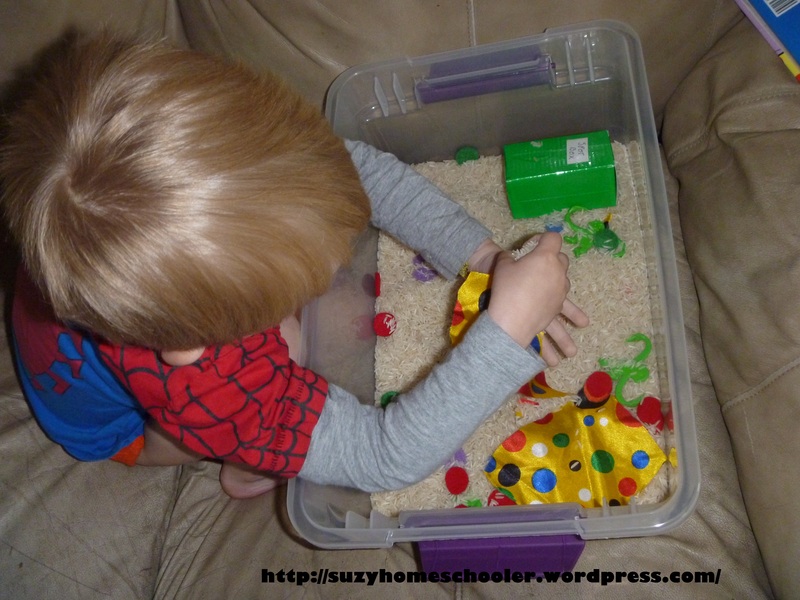 If you are interested in trying sensory bins but don’t know where to start, check out my Sensory Bin 101. 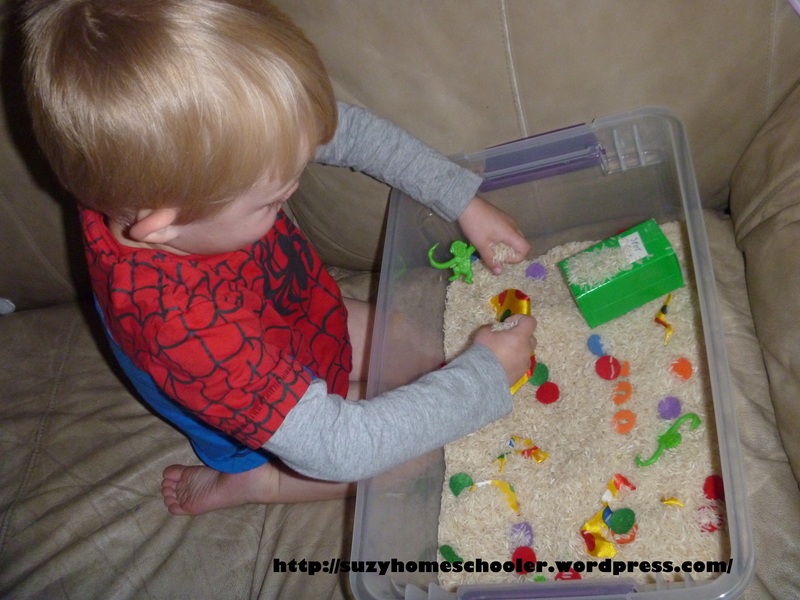 If you’re confused as to why your child should be playing with sensory bins then check out What is the Point of a Sensory Bin? 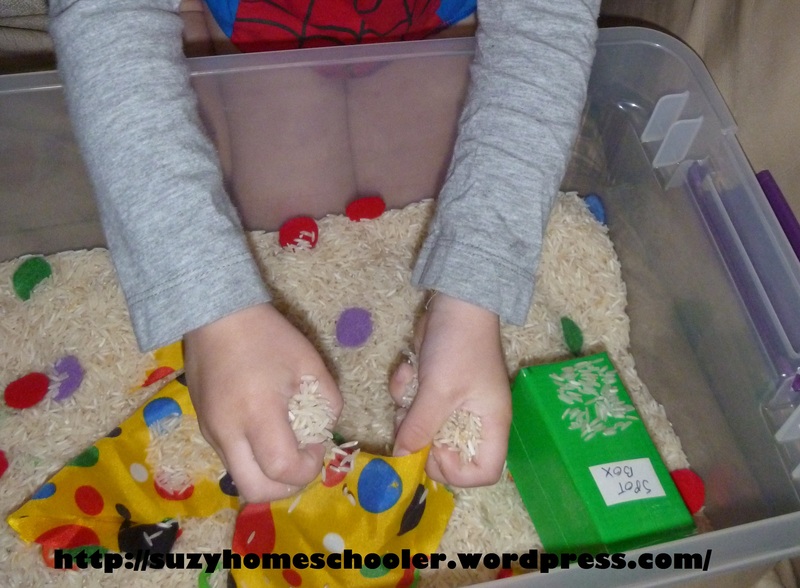 For more sensory bin ideas, check out my Sensory Bin board on Pinterest! 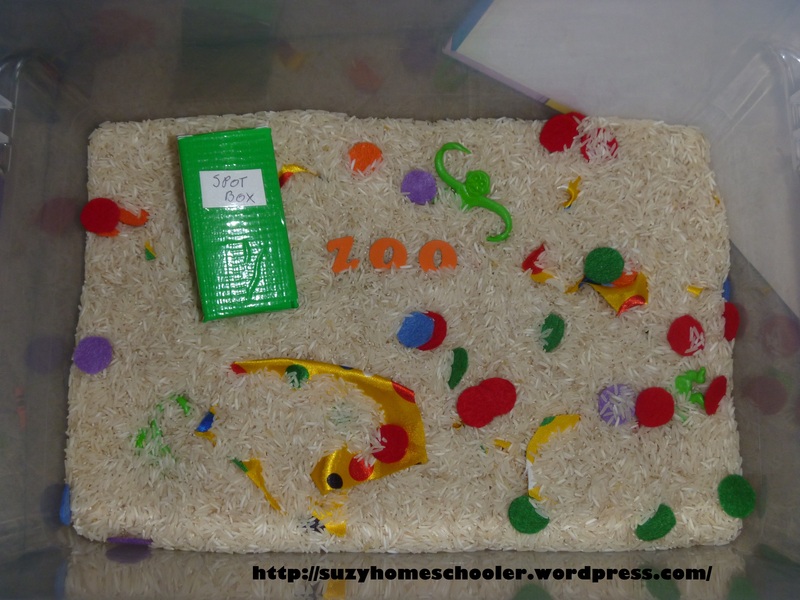 Follow Caitlyn Stock (Suzy Homeschooler)’s board Sensory Bin on Pinterest. We love activities to go along with the books we read. Thank you so much for linking this post to Discover & Explore. I’ll be featuring you tomorrow! Its so funny but I didn’t even realize it until you posted this comment, there is actually a huge error in my post, the book is called “put me in the zoo” not “take me to the zoo.” Ah well, I should probably correct that soon. On another note, I look forward to seeing what the upcoming week’s theme is! How did you make the antlers for the “Ring the Gack” game? Thanks! I had a large piece of thick cardboard that I traced the entire Gack (antlers and body) on to, then I cut it out in one large piece. I papermache’d over the entire thing to make it sturdier, then painted the Gack brown and the antlers cream. I attached a small box to the back of the Gack and filled it with bricks so that the Gack would be bottom heavy and more-likely to stay upright. I also attached a dowel rod to the back of the main part of each antler to keep it from bending over if it got hit hard with a ring. Overall the construction was time consuming but worth it. I spent less than $5 on the whole thing and it was a favorite game at the party. Also it was still in great condition despite some rowdy 3 year olds, so my son was able to play with it for a couple weeks after the party before we finally dismantled it. If you have any further questions, please feel free to let me know. I’ll help any way I can.